Green Room by Studio Githero in partnership with luxury watch maker Panera. This kinetic and interactive installation explores the concept of time by changing our perceptions of what a clock can be. 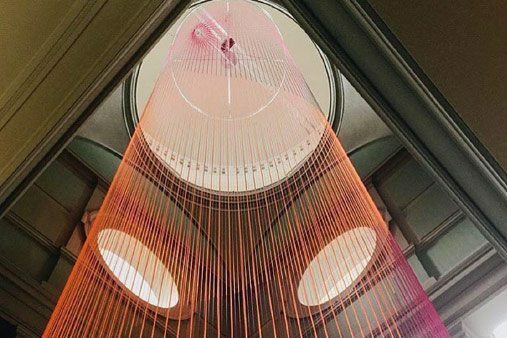 The installation is made up of 160 multicoloured silicone cords that are wrapped around the infamous stairwell on the west side of the V&A. Each cord is slowly lifts from their starting point and then returns back down again. What struck us the most about the installation was how it allows for a truly immersive experience. Green Room extends the six floors of the V&A, however you experience the encompassing wave of colour as soon as you step inside the lower ground of this dramatic space. The motorised revolving arm creates the feeling that you are caught admist the wave-like motion. Elsewhere, in the V&A’s tapestery gallery is Braun and British designer Benjamin Hubert’s 20-metre-long sculpture Foil. 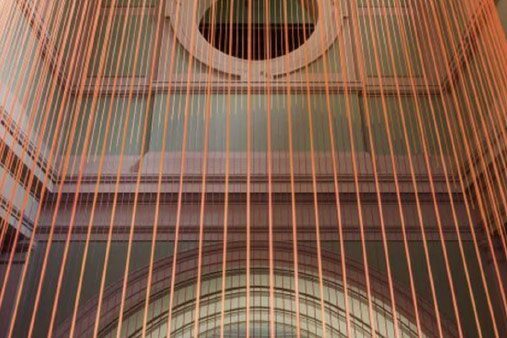 This kinetic installation runs down the room casting light onto the V&A’s infamous medieval tapestries. LED light reflects off the sculpture’s surface to create a slowly morphing pattern on the walls of the gallery and across the tapestries. 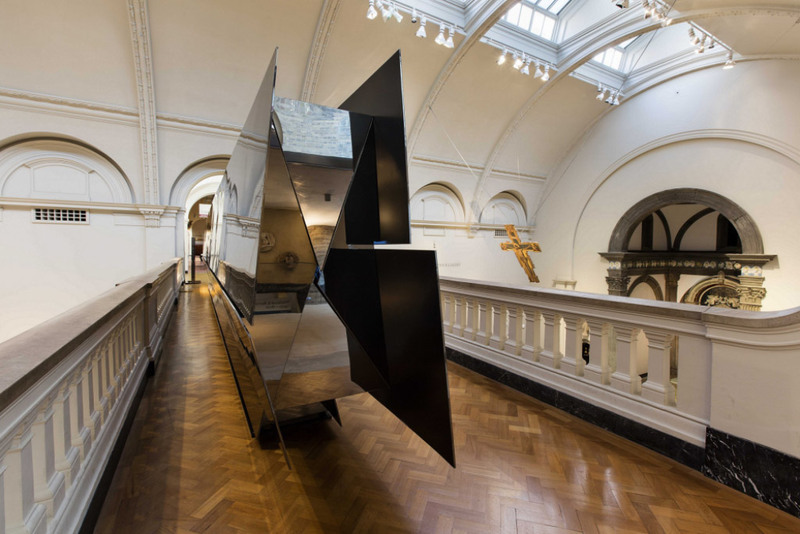 Similar to Green Room, the sculpture creates a wave-like motion offering visitors a truly immersive experience to interactive with the V&A’s existing surroundings and artworks. What we found particularly inspirational was the atmospheric soundscape that accompanies Foil. Working in unison with the scattered light across the tapestries, the environment becomes an extremely emotionally engaging. Visitors are surrounded in multi-sensory space which urges us to re-examine the existing tapestries within the context of a contemporary space. 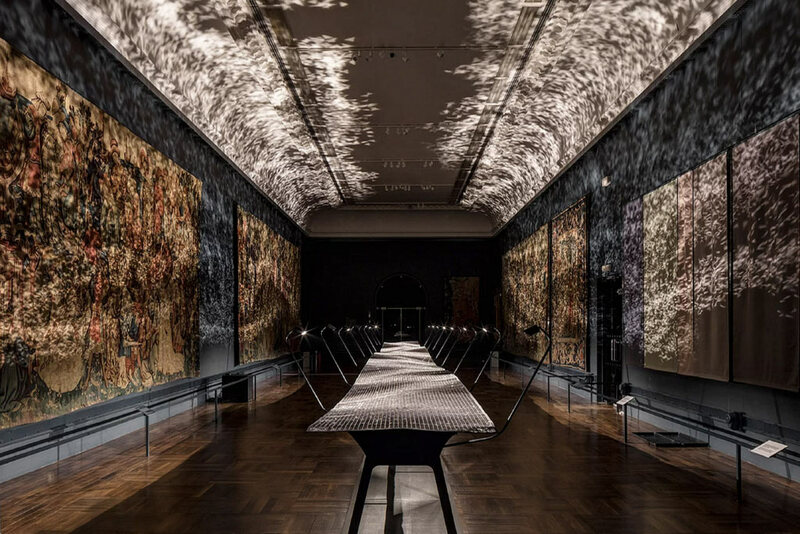 Tabanlıoğlu Architects, an Istanbul-based architecture firm, have also created a multi-sensory installation at the V&A. Beloved is a 12-metre-long mirrored black box that is based on the Turkish novel Madonna in Fur. It offers visiotrs the chance to peer inside through the cracks in the sculpture’s surface to see inside atmospheric scenes from the novel. These are re-created through cinematic techniques, physical objects, text, light and, like to Foil, sound. The installation is situated on the bridge, which itself acts as a metaphor to represent the novel’s story, which is about a relationship between a young Turkish man and a German woman, and is set between interwar period in Berlin and Ankara. The three installations will run until 25th September at the V&A.